Spanish colonial power in the Americas from the 15th to 19th centuries destroyed dozens of rich societies and decimated some of the world’s most sophisticated cities. However, one fortunate carry-over from the Spaniards’ grand plans in the western hemisphere was the urban plaza. Designed originally as open space bordered (typically) by a cathedral, governor’s mansion and administrative offices, the plaza has evolved into an all-purpose urban feature. Where troops used to muster, the city plazas of Latin America now help build a strong community bond. Any developers or municipal agencies looking to design an urban plaza today can learn a lot from the successful plazas of Latin America. Case in point: the plazas of San Miguel de Allende, Mexico. 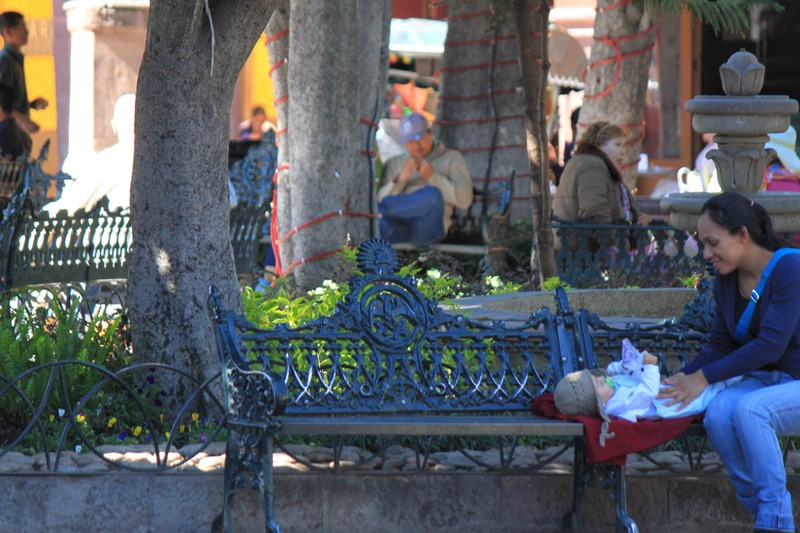 At almost any hour of any day, plazas like El Jardin, San Antonio and San Juan de Dios welcome a diverse blend of people and activities ranging from raucous to restful, from commercial to meditative. A shopper never knows who – or what – she may meet in a Mexican plaza, where fiestas seem year-round. 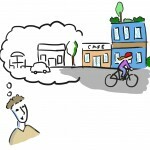 They attract individuals, families and larger groups. 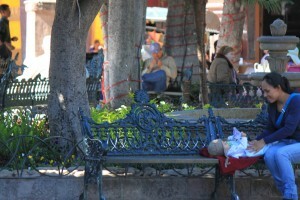 A mom, comfortable with her babe on a plaza bench. 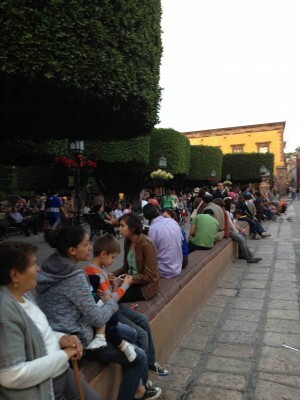 As is typical in Mexico, all generations mix and interact in public. 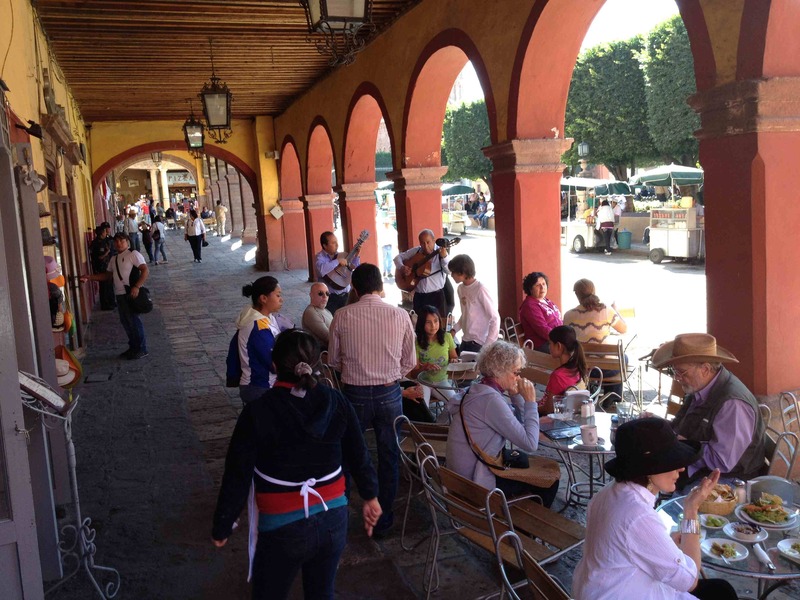 Spaces in Mexico rarely seem to be dominated by one age group or one demographic. Design wise, a colonial plaza proves the value of simplicity. Its square or rectangular space is broken into quadrants by walkways and often low border walls (great for extra seating). Iron benches located throughout the space so that, depending on a person’s interests and time of day, there is usually somewhere suitable to sit. Benches, benches, everywhere: new bench being installed at San Juan de Dios plaza. Trees provide shade or (needed less frequently) rain protection. 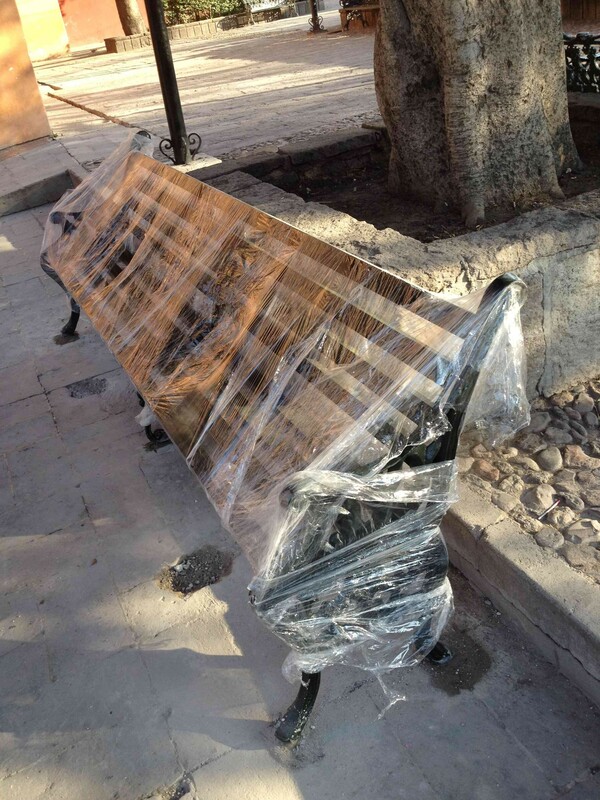 There is often a dramatic focal point – a sculpture or prominent historic building. 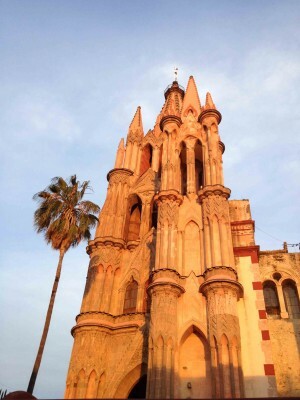 In the case of San Miguel’s central El Jardin, that roll is played splendidly by La Parroquia, a cathedral with a prominent neo-Gothic facade made of rose-coloured stone that glows in the high mesa light. Sit and admire La Parroquia from the plaza. El Jardin (formal name Plaza Allende) provides a great space to sit and appreciate La Parroquia, or to watch the regular stream of visitors who come to snap pictures in front of it. Or to enjoy an ice cream and chat with neighbours. Or listen to music. Or dance. 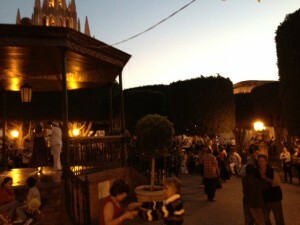 One night during our recent stay in San Miguel, we wandered down to discover that the spaces at the centre of the plaza were filled with couples dancing salsa. Salsa dancers sway at dusk. The plaza’s perimeter provides enough space for crowds during special events. The buildings on the other three sides of the plaza house stores and restaurants. Sidewalk cafe next to the plaza. 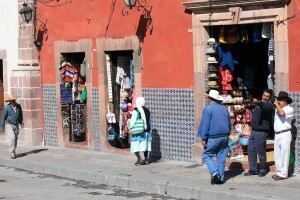 Shops open onto the street adjoining the plaza. And adjacent uses are varied. 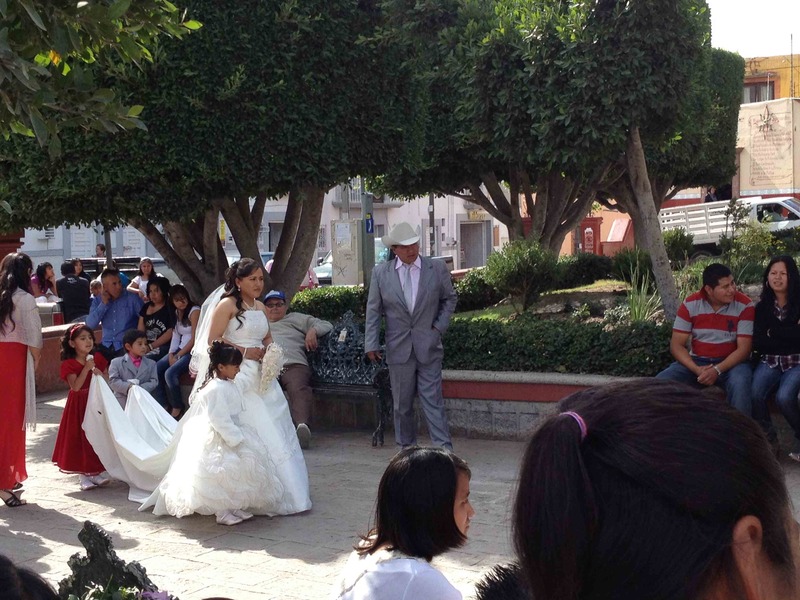 At another church plaza that attracts people day and night, in the San Antonio neighbourhood, weddings are taking place while vendors sell tostados or kids play games. 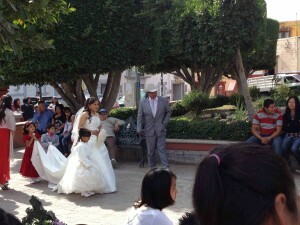 A bride and her flower girl make their way through San Antonio plaza in San Miguel de Allende. Meanwhile, an active car repair shop does its work directly across the street – or just as often, in the street. 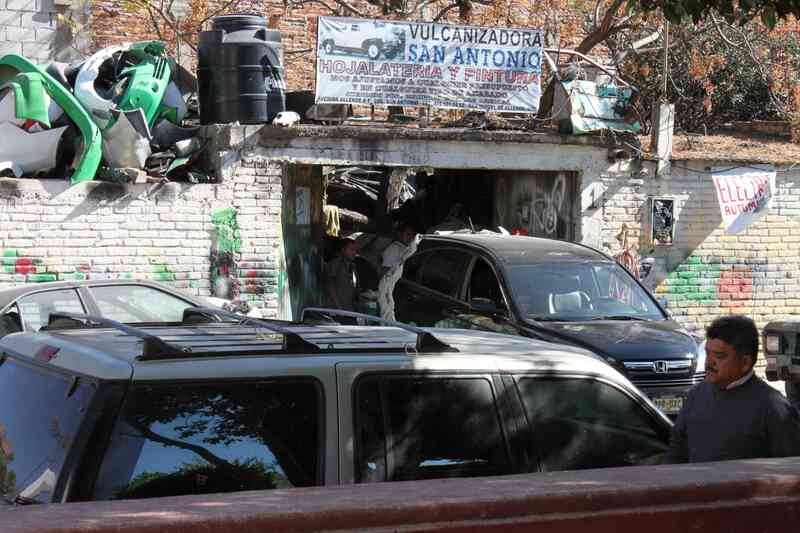 Just across the San Antonio plaza border wall, this SUV is receiving a new coat of black paint. 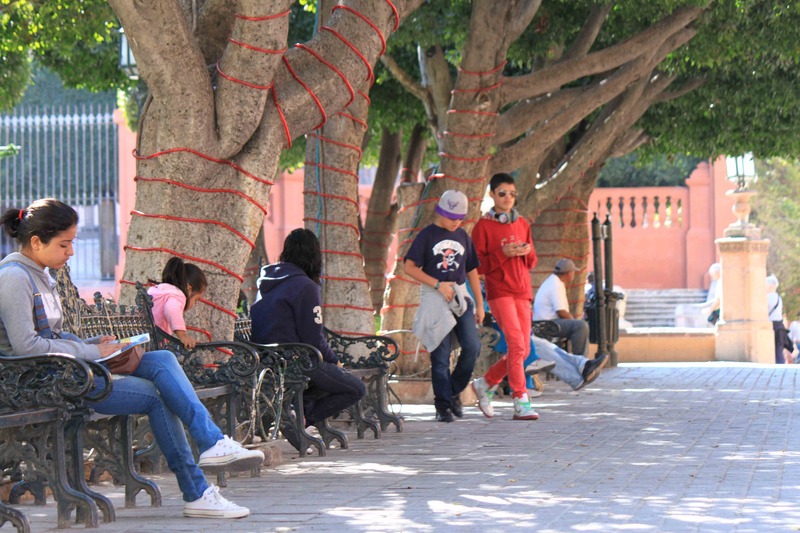 The success of these plazas is that they bring people together in safe and comfortable ways, through special events or just a morning conversation. 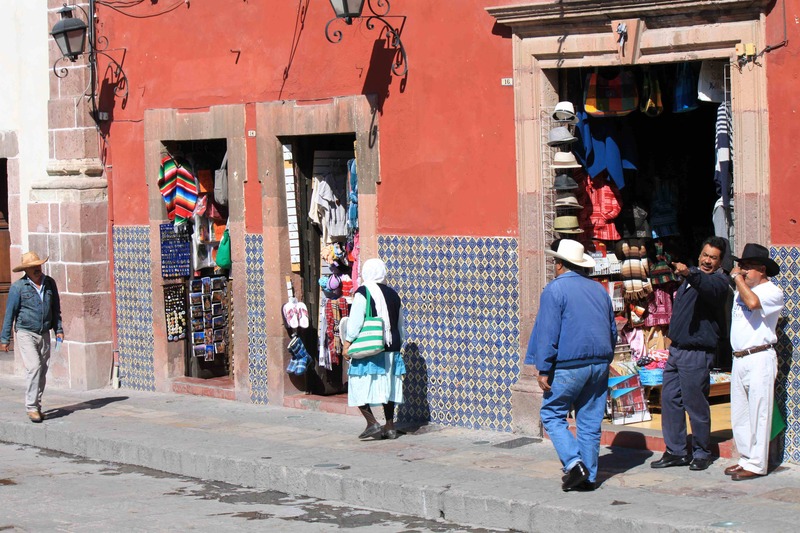 Their designs allow mixed uses and the streets adjacent to the plazas are busy with retail, food services, school groups and church activities. 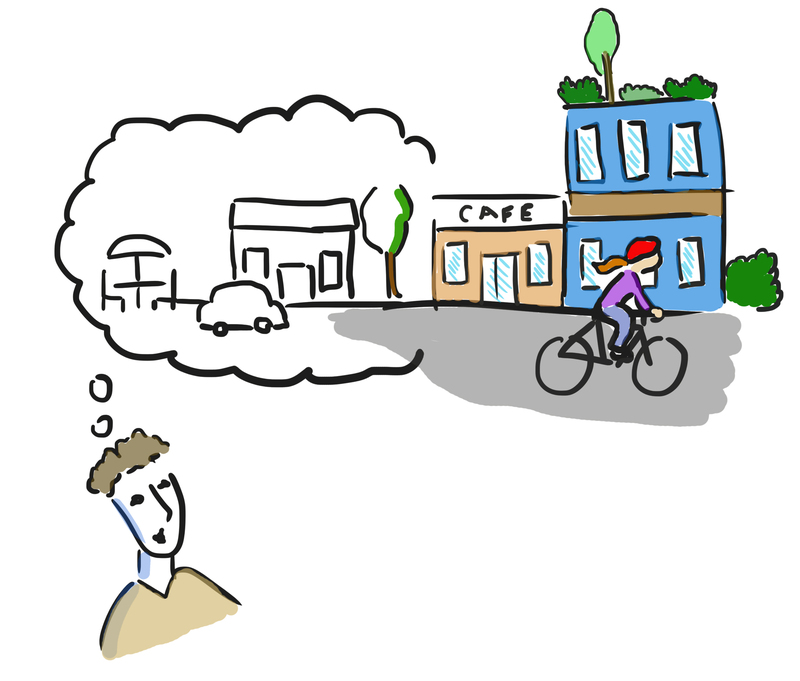 There are literally dozens of activities to interest someone out for a morning or evening walk. 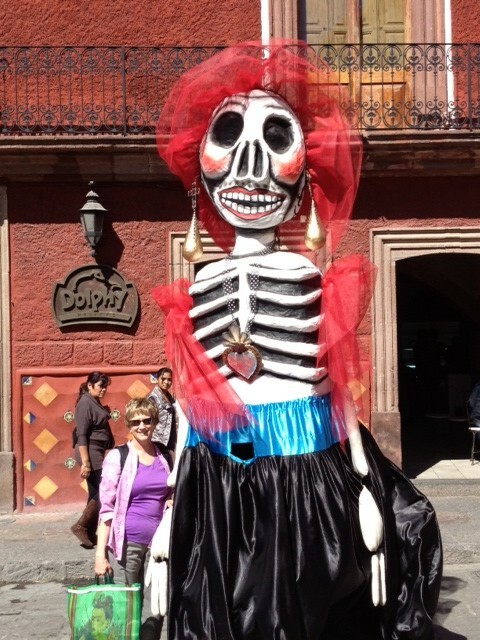 No doubt a good part of that success is due to Mexican culture – one that emphasizes multi-generational family activity. 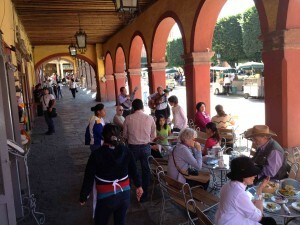 Perhaps, though, the plazas themselves play a role in building that culture.